Kennedy 92 ii/iii; Glasgow iv/vi, before the erasure of the date and further work on the top of the chair. Drypoint and roulette on thin wove paper. 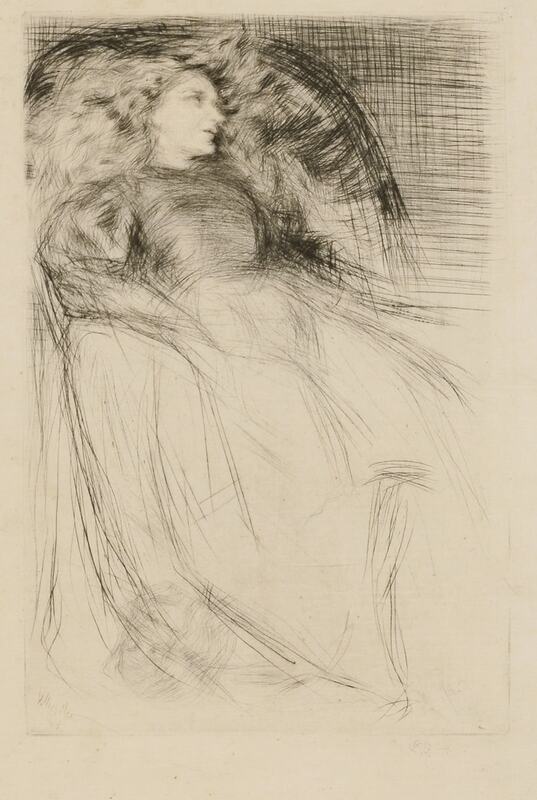 This romantic study of Joanna Hiffernan, Whistler’s mistress, is one of the artist’s most celebrated prints and is extremely rare, especially signed with the butterfly. Jo Hiffernan was also the model for his famous painting, Symphony in White, No. 1: The White Girl. Harris Whittemore purchased both the painting and this lovely impression of Weary. 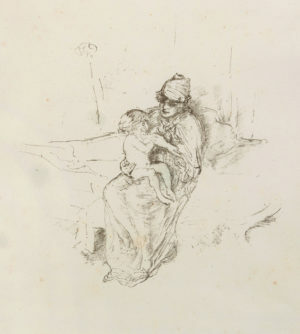 During the early 1860s Whistler was closely associated with the Pre-Raphaelites and Weary shows the influence of Rossetti. 7 7/8 x 5 1/8 in.